A platform for marketers, media buyers and affiliates! 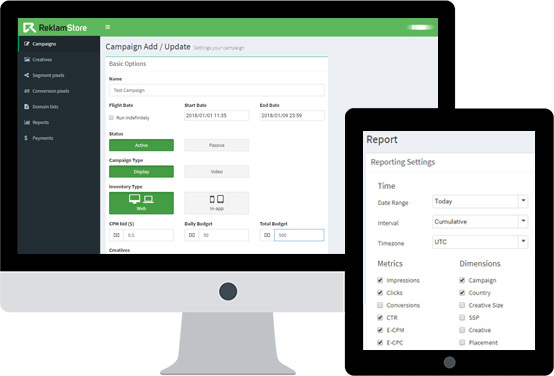 Manage your ad campaigns across display, mobile and video advertising channels. 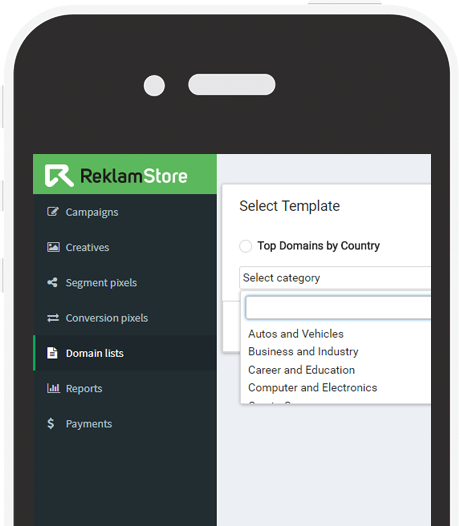 Spend your digital advertising budgets more effectively with ReklamStore DSP! With our all in one platform simply integrate with ad exchanges or directly with SSPs to buy ads in real time! Take advantage of our numerous and advanced targeting options such as traffic and audience! 3rd Party tag support: JS tag, rotating tags etc. Advanced targeting options: Geo, device, SSP, browser, operating system, carrier, white-listing and black-listing. Whether you are an expert or just a beginner – creating ad campaigns and optimizing your results with ReklamStore DSP is very easy! Create all your advertising campaigns in seconds. ReklamStore DSP integrates with all SSPs and ad – exchanges in real time. 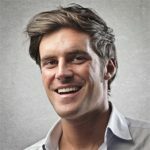 Find out how ReklamStore DSP works? Demand-side platforms are technology systems that let advertisers manage advertising inventory, maximize ad performance and pricing (through bidding) and consolidate user tracking (across several ad networks). A DSP enables advertisers, agencies and ad networks to buy display impressions across multiple ad exchanges (DoubleClick, Right Media, ADSDAQ, etc). While a number of ad networks — their raison d’etre under threat — are trying to rebrand as DSPs, the “real” DSPs have sophisticated black box targeting and optimization algorithms (“decision engines”) that help advertisers and agencies get the most value for each individual impression. Basically, these decisions engines do serious number crunching to establish the value of an incoming impression then place a bid accordingly. This is all done in milliseconds. What is the best DSP to be used by a small business? What is the minimum ad spend? How friendly is the user interface? Is it simple enough so that a fifth grader can navigate through it? Support – DSP may help you launch your first campaign and assist you if you there are problems in your campaigns? How about 3rd party data? DSPs also help the advertisers and agencies to tie their own targeting data or targeting data bought from third parties into the DSP’s decisioning engine. These third parties might include individual data providers (like DataLogix or Experian) or actual data exchanges (like BlueKai or eXelate), which are marketplaces where individual data providers can sell their cookie data to advertisers looking to target ads. Powered by Real-Time Bidding (RTB)? With respect to how DSPs work, specifically the audience targeting capabilities, it is made possible using a technology known as real-time bidding (RTB). With RTB, every time a page load on a publisher’s website, the ad space on the page is auctioned off to the highest bidder in real time — meaning milliseconds. The bidding process is conducted by the ad exchange, and the bidders on the ad space do so via DSPs. In the entire process, the advertiser never has to interact directly with the publisher. In other words, DSPs are the bidders on behalf of advertisers, and the ad exchanges and SSPs are the auctioneers on behalf of publishers. In all of this, the actual “goods” being auctioned off are the people (or audiences) viewing the publisher’s ad inventory. What is the main advantage to a white-labeled DSP? The main advantage of White Label DSP is it’s cost-effectiveness. Imagine how much it would take you to build your own DSP, hire tech team to operate it and maintain it, train those people, retain them, and so on. Building your own DSP is time-consuming and frankly speaking, expensive. Especially if your marketing budget is not high, building your own DSP is not wise. Fortunately, there is an alternative – to get a White Label DSP, rebrand it, fully customize it and use it as its own. What kind of companies use white label DSP? Well, it is the best choice for companies and businesses that want to minimize production costs, save up on research and development, enter market as soon as possible, or for companies that do not have a special registration or licensing. As a conclusion, I may add that there are many advantages White Label DSP has to offer. Which are the main challenges in real-time bidding facing DSPs today? Marketer education – Need to educate the marketer (advertisers/agencies) on where specific data is coming from (transparency of origin). Hyper-Growth – Growth and competitive pressures have left many DSPs scrambling to scale their business processes, software quality control, and customer support to keep up with their published roadmaps. The inconsistency of media supply, both for volume and quality – DSP’s need to have consistency in the media to effectively optimize the campaign based on available data. Despite the massive growth of RTB supply, the huge discrepancy in media values puts upward price pressure on the higher quality supply sources.This forces DSPs to bid on lower value media which is more winnable, but often does not perform very well since most DSPs only get paid when/if their advertisers win the ad impression. Measurement of value – DSPs are still not sophisticated when it comes to attribution modeling, a critical component of display ad value measurement. The advantage of using a white-label DSP? Really the advantage of using a white-label DSP is that it allows you to show your client something that looks proprietary. In terms of its performance, there will be no change as white labeling is usually just adding a logo, changing colors, and maybe how your pixels look like. Usually, media resellers, trading desks, and agencies use white-label DSPs. How does ReklamStore DSP look like? Here are some screenshots from our platform. We provide a self – serve advertising solution for advertisers to target the right audience with the right ad model by analyzing users’ demographics, interest and behaviour according to their web browsing history. What our clients say about ReklamStore DSP Read what our customers say about working with us! Since I have been using ReklamStore’s DSP I have been able to achieve great results for our performance campaigns! This DSP combines precise targeting options with the top SSP traffic sources, all rolled up into one great platform! 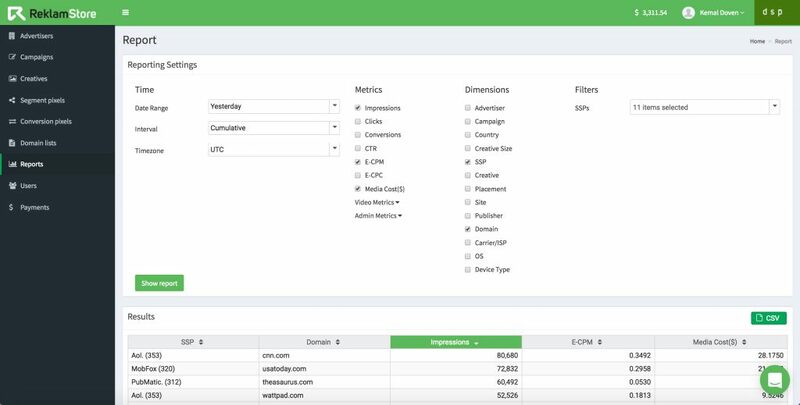 The simple interface allows us to easily create campaigns and segment them towards the best performing sources, and when we need that extra insight – our AM is always available with some great suggestions! Copyright © 2017 Powered by ReklamStore.